Gurudev Shri Shri 1008 Shrimad Vijay Rajendra Surishwarji Maharajsaab was one of the greatest dedicated and impressive preacher all over the world. In the year 1883 pous shukla 6th thursday or 1826 e.d. 3rd December in Bharatpur Shrimati Kesarbai, wife of Shri. Rishabhdasji gave birth to a great Shrimad Vijay Rajendra Surishwarji Maharaajsaab.His birth name was kept as 'Ratnaraj'. He had such a brilliant grasping power that at age of 10-12 years he had acquired all the educational studies. He was most obedient to the elders. He was always attracted towards sole minded with sacrificing attitude towards a calm and peace of mind. At the age of 12 with permission of his father he visited the 'Kesariya Tirth' with his brother Manikchandji.On the way while traveling he cured the defect of Shri Soubhagyamalji's daughter and saved her from heavy suffering. Due to this incident he approached to a simple, sacrificial, fully devoted life and headed for higher education. He also visited Bengal , Sinhaldeep (Ceylon or Sri Lanka ) and Calcutta with his brother for business purpose , they had diamond business . He again returned to Bharatpur. After some days his father and mother passed away leaving him to live a sole, unselfish, always helping nature towards other. He began to be more anxious to have the company of great Acharyas and Muniraj. In 1904 Vaishakh shukla 5th Friday , a great day , with the order of his elder brother, Under Shri Hemvijayji Maharaajsaab he was sworned "Yati-Diksha" and was named as 'Shri Ratnavijayji' in the presence of the Sangh. Looking to his command over preaching and having impressed with his performance he was then fully promoted by awarding him the panyas padvi in a big Dikhsa ceremony by Shri Devendrasuriji maharaajsaab at Udaipur. In 1923 Dharnedrasuriji maharaajsaab had his Chaturmas at Ghaneraonagar in Rajasthan. After sometime Shri Ratnavijayji maharaajsaab along with Pramodruchiji and Dhanvijayji and their selected yatis left for Ahore (Jalore (Dist) in Rajasthan) on Maadka sudi 2. In 1923 vaishakh shukla 5 wednesday with order of Sangh, Ratnavijayji was sworned with the ' suri ' mantra and Designated as ' Shri Pujya Padvi ' , a great honorable degree to be greeted with. At the same function the thakur of Ahore presented Shri Pujyaji with Chadi , Chaamar , Paalkhi & Suraj Mukhi etc. Shri Sangh popularised Shri Pujyaji renaming him as Shrimad Vijay Rajendra Suriji Maharaajsaab' Passing and travelling through many villages Pujyashri had his Chaturmas at Jawara in 1924. In 1925 Chaturmas on 20th Wednesday with his selected disciples munishri Pramodruchiji m. s. and Shri Dhanvijay m. s. and others attended the function of ' Kriyadwaar ' meant as Sworning of sacrificing all five essential requirements "Pancha mahavratdhari" degree of higher dignity. Even the nawab of Jaawara could not control his tears after seeing the great sacrificing deed of m.s. With their great efforts Shri Jayprabha Vijayji Maharaajsaab and social worker Shree Jethmalji Runwal (Jaawara) Dadawadi of Jaawra is now well known holy place (tirth) to visit. He had his Chaturmas of 1962 in Khachraudnagar . During this Chaaturmaas the native people of Chirola were facing a deep trouble, but with his great efforts and power, those problems which even the native Sahukars, Sadhus, Acharyas etc. failed to solve the problem were readily solved by him. Chirola Panthi Jan had a great relief for such a great deed for them. Ratnavijayji maharaajsaab was well-known all over India for his mastery in Jyotish-shastra ( fore casting of fortune). Where ever he suggested the "Muhurta" timings the function, or the anjanshalaka or the felicitation always had a great success in it. During his chaturmas in Ahore ( Jalore (Dist) in Rajasthan ) he did anjanshalaka & prathista of Shri Godiparshavanath temple which is famous because it is the only temple to have prathista done to 52 jinalay at a time. The temple is famous also because of chamatkars done by Shrimad Vijay Rajendra Suriji Maharaajsaab. One of the chamatkars of temple is , the temple has two big murti's ( statues ) one of which is of Mahaveer Swami , they are huge and cant be carried even by twenty people but due to chamatkar done by Shrimad Vijay Rajendra Suriji Maharaajsaab the murti was carried by four people. His Sadhu Kriya was the toughest and hard one to follow. Even though he was old enough he never ever took help of his disciple in handling his equipment in day to day life. He had a unbelievable capacity of walking. Even the youth disciple failed to race them in walking. Till his last breath he used only his feet as a traveling source and nothing else. In the thunder cold he use to have the daily prayers 'Pratikraman' and meditation with no clothes over his body. In the free time he used to teach, discuss, and have lectures on scientific, religious matters with his disciples was one of his daily schedule. Looking at his dedicated hardships and hard work, following his ideal path about 250 men joined and too the Diksha for meditation. In his life Shrimadgurudev had written & composed a number of books, granths, most of them were in sanskrit language. His most important edition was "Aabhidhaan Rajendra Kosh". This kosh was composed in a simple manner containing 4.5 lakh shloka and 'a' karadi varncum of 60 thousand prakrit words as a collection. It contained and exposed principles, history, culture and vedant , judicial special meanings and other matters were published having their own advantages and disadvantages in life. His final Chaturmaas was at Badnagar (Dist. Ujjain) M.P. After completing the Chaturmaas Gurudes resided on the banks of Maahi river near Rajgadh ( Rajgrahi ) Dist. Dhaar. At that time he got attacked with a minor breathing problem which slowly converted into into a major problem. It was cold winter, the disease gradually increased, but still the sadhu-krya was not slow down. He called up all his sadhus near him and told them that his time to leave the world is near but they should not get depressed and should carry on their regular duties and prayers without fail. Discontinuing the meditation and all duties of a sadhu may lead to a bad character and unsuccessful of the work done before. On the 21st December Friday 1906 saptami or Vikram Samvat 1963 Pous Shukla , the great helping nature. Religious-preacher Acharya Gurudev laid down his body for the Moksha Prapti (for heaven) till death in a still Samadhi. 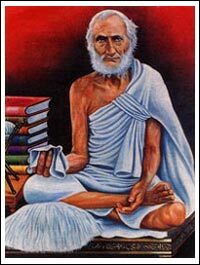 A great saint who was in his own a different kind having same date of birth and death. Even today Shri Mohan Kheda Tirth is most reputed holy place all over the world . Every year devotees from all over world (in lakhs) gather here to attain the Spiritual and Chamatkarik Aarti of Gurumaharaj on Saptami.